Sunrise SR-M660 220 Watt Solar Panel Module – this is an independent review for Sunrise SR-M660 220 Watt Solar Panel Module we have compiled for your reference. Feel free to add your comments or experiences at the bottom of the page. *Our solar cells offer high conversion efficiency of up to 18% for Monocrystalline and 16% for Polycrystalline cells. *Our high performing modules have an industry low tolerance of +/- 3%. *Our products are produced with rigorous quality control standards and a worldwide certification program. *Our power output warranty of 25 years. *Our strong R&D program keeps our products at the leading edge of solar technology and continues to increase efficiencies and reduce costs. *Our continued growth in capacity enables us to provide excellent customer service of high quality solar energy products. *Our solar design solutions are redefining architectural designs across the globe. The graph below shows the typical power produced (in Watts) for the Sunrise SR-M660 220 Watt solar panel module at maximum available sunlight (irradiance). The Sunrise SR-M660 220 Watt solar panel module has a maximum output of 220 watts. 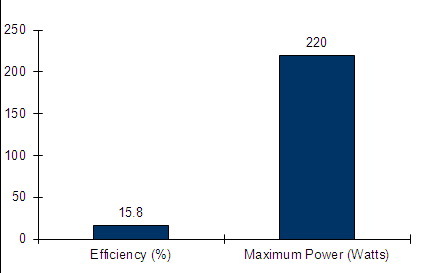 The graph below also shows the efficiency of Sunrise SR-M660 220 Watt solar panel module. Efficiency is an important thing to look at when comparing solar panels, since it affects how much power can be captured from the sun. The Sunrise SR-M660 220 Watt solar panel module has a module efficiency of 15.8%. Size is an important thing to look at when comparing solar panels, since it effects how much power can be captured from the Sun, and explains how many panels will be required to meet your need. This solar panel has a panel size of 1.62 metres squared. If you are thinking of buying a Sunrise SR-M660 220 Watt solar panel module, we'd advise measuring your solar resource first. Doing this will give you a much better idea of how much power you might generate. This is a MCS qualified product. Click the button below to add the Sunrise SR-M660 220 Watt Solar Panel Module (Discontinued) to your wish list.